Built by Consolidated at San Diego. Delivered to the US Army. Ferried overseas via Hawaii to Australia. Assigned to the 5th Air Force, 90th Bombardment Group, 319th Bombardment Squadron. 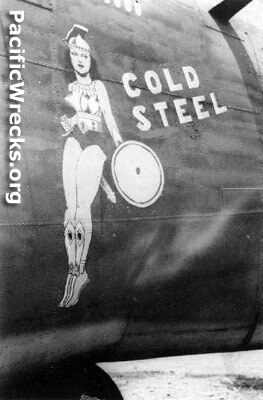 Nicknamed "Cold Steel" in white with nose art of an amazon warrior woman holding a shield and sword behind her. This bomber flew at least 39 bombing missions and claimed at least three enemy aircraft shot down. When lost, engine R-1820-45 serial numbers 42-87720, 51902, 42-87712, 41-44509. No weapon serial numbers are noted in MACR. On March 5, 1944 took off from Nadzab Airfield No. 1 on a bombing mission against Hansa Bay. This bomber and crew disappeared in heavy thunderstorms. No radio transmissions were ever received from the crew, and subsequent searches did not locate them. The next day, a group of A-20s and B-25s on a return flight. Also three B-24s from the 319th BS also searched the Hansa Bay area. No trace of the missing plane was found. During 1979, discovered by a group of young explorers from "Operation Drake" at an altitude of roughly 10,500'. They found a large wheel and wreckage north of Tauta. They did not find a serial number, incorrectly reporting to the press that they had found a "B-16". Bruce Hoy, curator of the PNG Museum notified US Army CILHI to investigate the crash site. No action took place until October 1988, when following a recovery mission in the Wau area, the site was resuscitated. On October 13, 1988, Bruce Hoy flew to Tauta and met with local officials. Flew to another nearby village Parimo and spoke to the villagers who had accompanied "Operation Drake" trekkers during 1979. They agreed to walk up to the site and clear a helipad. 17 October 1988 - departed late from Lae and circled the mountain where the helipad was to have been constructed at 8.20am. Cloud prevented us finding it. Landed at the village and collected a headman. Again the pad could not be located. Returned to Lae. 18 October, 1988 - pad located but of insufficient width for the helicopter to land. Villagers requested to widen it for our next visit. Team departs Lae for Port Moresby. On July 4, 1989, two members of CILHI with Bruce Hoy, PNG Museum, landed near the crash site and established a camp. Rain set in, and we remained in camp for the rest of the day. Very cold with the altitude being 10,500'. 5 July, 1989, to the crash-site at 7.55am, reaching it at 8.35am. The crash site is located down the ridge from the camp and covered the south-east section of a ridge. Located the major portions of the wings, right tail fin from which the serial number was recorded, two and possibly three engines and a large portion of the left rear fuselage. Much evidence of disturbance by previous parties including beer cans and wine bottles. Only one large calibre weapon seen. Other portions found included both main landing wheels with tyres, but no apparent evidence of the nose wheel nor forward part of the aircraft. Much wreckage being buried. Hoy identified the aircraft that day from records brought with me on site. "I seem to recall that a report came to me at some time between October 1988 and June 1989 that a group had flown into the newly constructed helipad, and brought out several machine guns. With wine bottles being present, one can only imagine how disrespectful this party treated the site. A helicopter must have been used for beer and wine to have been brought onto the site, as no way would anyone carry these up from the closest village. A large fire had been lit nearby, which fortunately, later proved to have been on sterile ground. [No human remains underneath] Whatever, whoever removed those guns did so illegally, as well they did disturb the site." During August 1990, another CILHI team visited the crash site to complete the investigation. Afterwards, the recovered remains of the crew were identified using mitochondrial DNA testing. On November 26, 2001, a Department of Defense news release announced that the remains of the crew were identified and would be returned to their families. The entire crew was officially declared dead on January 25, 1946. All are memoralized on the tablets of the missing at Manila American Cemetery. After the identification of the recovered remains, the crew was buried at Arlington National Cemetery in a group burial at section 60, site 8017 on December 6, 2001. Smith has another grave (memorial marker?) Maple Hill / IOOF Cemetery (Princeton IOOF Cemetery) in Princeton, IN.